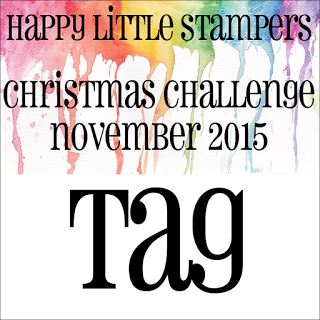 Today I am thrilled to have been asked back again this year to be one of Loll's Guest Designers for her Twelve Tags of Christmas. 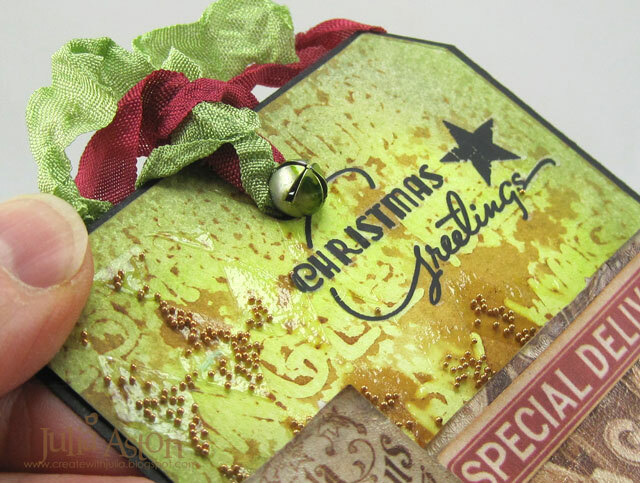 Our tags need to be Mixed Media - Loll has defined mixed media as stamps and ink plus two other elements that add texture and/or dimension. 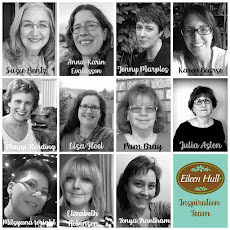 The inspiration tags by the designers will be showcased from the 4th-15th of November and the linky will remain open until the 22nd November so it gives you plenty of time to enter. Here is a list of prizes! 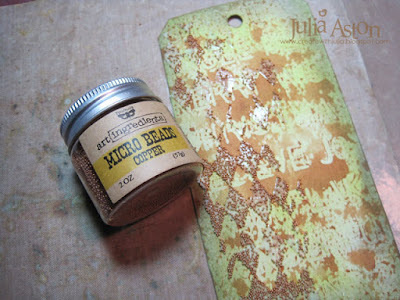 I used a technique from Tim Holtz to create the background of my tag today. It's called Layering Stencil Monoprint and you can find it in Tim's Compendium of Curiosities Vol III page 48. Basically, you rub Distress Ink all over the back of your chosen stencil (I'm using Christmas). Then you spritz the stencil with water and press it against your surface. 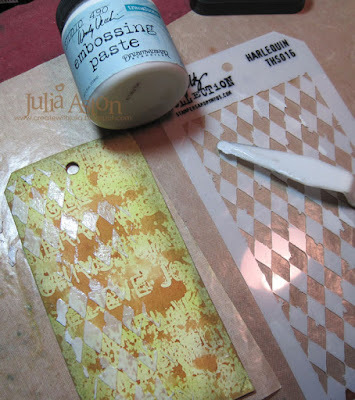 I die cut my tag out of watercolor paper using Tim's Tag and Bookplate die. 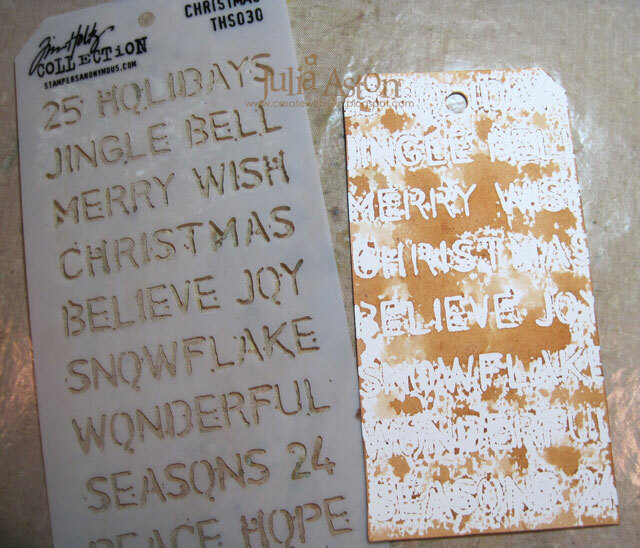 When you remove the stencil - you have a negative of the stencil. 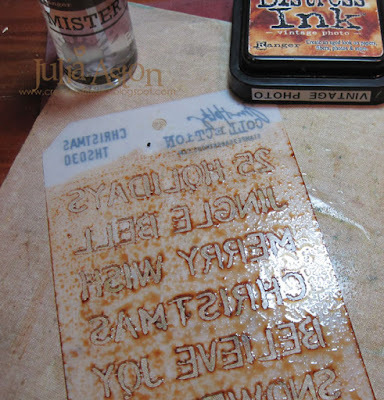 Your result will depend on how much ink and how much water you used on the stencil. It can also vary based on what kind of paper you use - so if you try it - try it out on different kinds of paper! I'm happy with my 'partial' stenciling results here. Then I sponged over the tag with Distress Twisted Citron Ink and sponged the edges with Distress Hickory Smoke Ink. 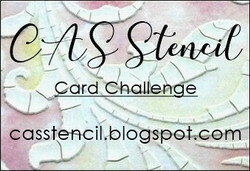 I also cut out some images from Paperstash/Merriment that I wanted to use on my tag. 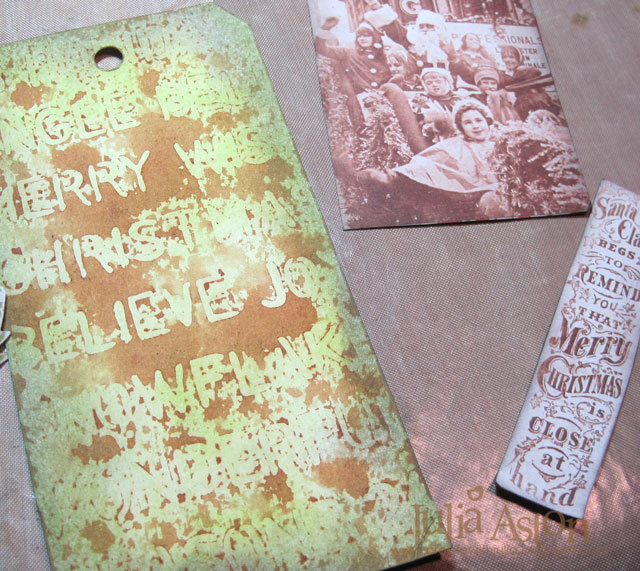 I brushed Distress Clear Rock Candy Crackle Paint over the images (not the tag) and let them dry. To add some texture to my tag, I used the Harlequin Stencil with Wendy Vecchi Transparent Embossing Paste. I only stenciled on the left side of the tag. The paste is white when it goes on - but turns translucent when it's dry. To add even more texture I poured some Copper Micro Beads over the paste before it dried. 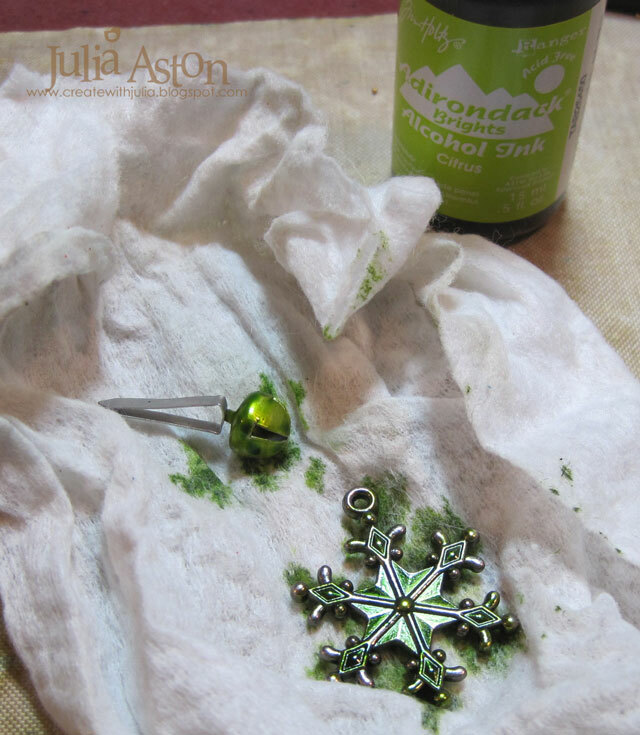 I colored a Jingle Brad and Snowflake with drops of Citrus Adirondack Alcohol Ink, drying them with my heat tool. I added a sentiment Remnant Rubs/Christmastime to the top corner and looped some wrinkled seam tape through the hole in the tag, also placing the Jingle Brad through the hole. 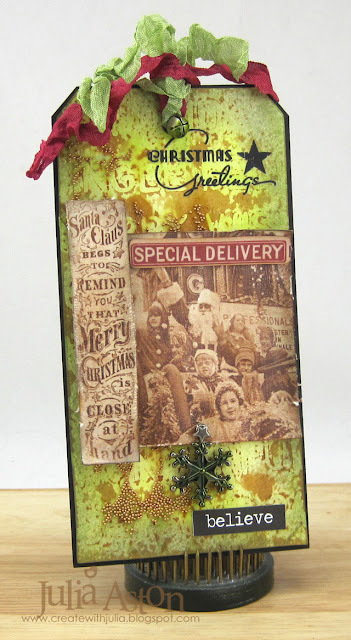 I adhered the images from the patterned paper with foam tape, adding Special Delivery from Tim's Festive Ephemera pack. I adhered the Adornments/Snowflake with a Star Fastener and placed a Big Chat Sticker in the right corner. Here you can see the translucent stenciling near my thumb. It's a subtle texture. 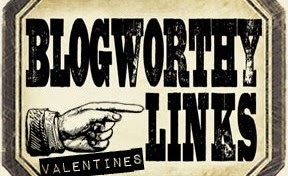 Please check out Loll's Blog for her tag today as well Lee-Anne's and my own! 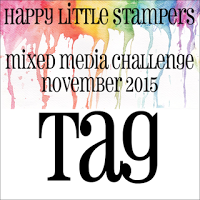 You'll also find all the details of the challenge so you can join in as well!! Accessories: Wendy Vecchi Translucent Embossing Paste, Harlequin and Christmas Stencils - Tim Holtz, Tag die - Alterations, Copper Micro Beads - Finnabair Art Ingredients, Idea-ology Big Chat Stickers, Remnant Rubs/Christmastime, Adornments/Snowflakes, Star Fasteners, Jingle Brads, Festive Ephemera, Citrus Adirondack Alcohol Ink, Ranger Distress Clear Rock Candy Crackle Paint. What a beautiful vintage tag!! Beautiful work! Thanks for posting the step by step tutorial, I know how much work is involved in doing this and it is greatly appreciated! Oh, this is pretty! Love the greens! 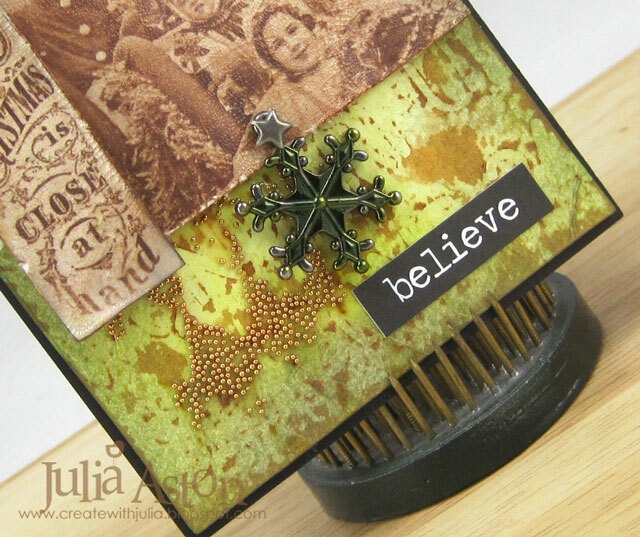 This is a beautiful, vintage tag, Julia! Thanks for giving the step by step. I want to try that stencil print technique. What a fabulous vintage tag! 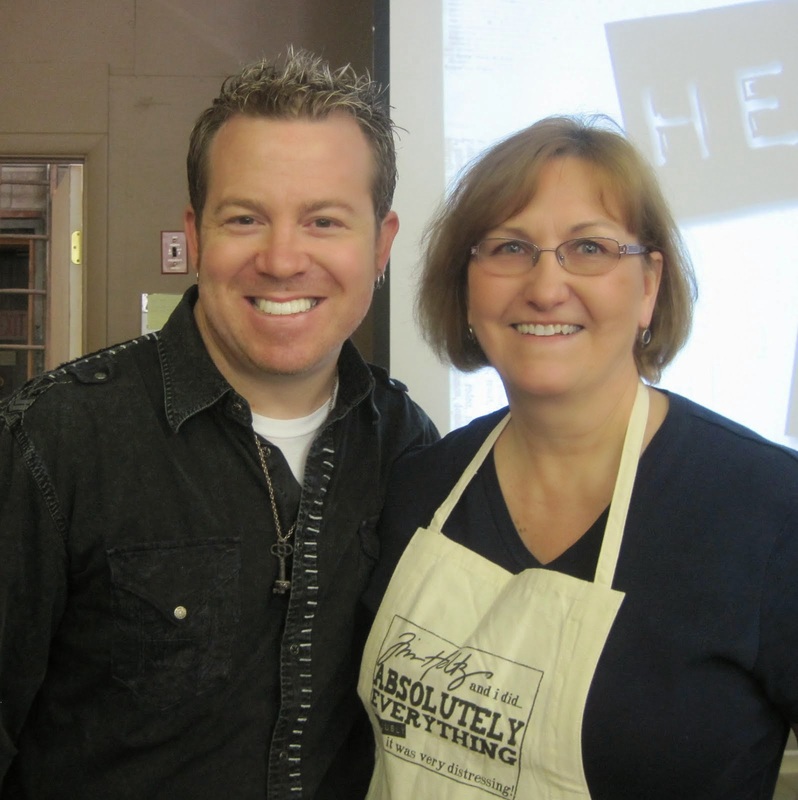 Fabulous mixed media! And I love the vintage look. Thank you for the step-by-step instructions - as someone who is just learning to do mixed media, I really appreciate it! Gorgeous vintage tag, Julia! As always, you bring together so many elements effortlessly! 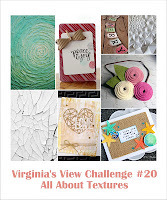 A fun post to read all the techniques used on this beautiful tag! The translucent paste looks wonderful, as did the tiny beads. Lovely colors, and liked the crackled picture trims. Coloring the bell and snowflake just added so much more detail to an already gorgeous tag. Lots of details, texture, color and all things festive. 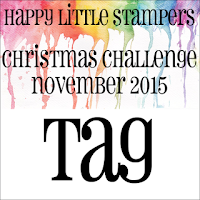 TFS and joining in with the November HLS Christmas Tag challenge. 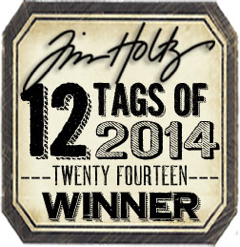 This is an absolutely wonderful tag, Julia - a worthy guest spot for the 12 Tags. 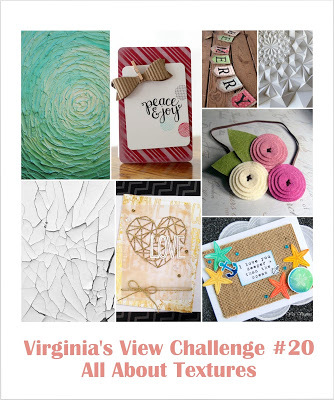 I adore the layered background and especially the images and words from the papers - beautifully done!